A menu printing service offers mini menus as an effective marketing tool. These attractive brochures can be ordered conveniently through an online printing service. A menu printing service allows business owners to order these tiny promotional items which are portable reminders for customers to make a return visit. Print restaurant menus can be carried in wallets, purses, and pockets and passed from one client to another. Online menu printing is the most economical way to print restaurant menus. A menu printing service gives the customer a variety of options for their online menu printing needs. Colors, sizes, and designs can be chosen for print restaurant menus that grab attention. When ordering mini menus from an online menu printing company, businesses can expect their purchases in about a week. Once these promotional items start to circulate, customers will begin to ask for them and pass them to friends. In this way, print restaurant menus help generate new clients. 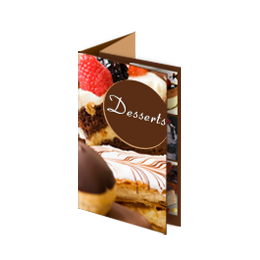 Printed on 4X10 inch card stock, mini menus are like a business card with added benefits. By ordering these through an online menu printing company, a business can keep its name and number at the forefront of attention. Mini menus can set a restaurant apart from its competitors, ensuring repeat business. An online menu printing service makes ordering easy with representatives provided to guide clients through every step. Mini menus not only promote your restaurant, they are convenient for your guests. These portable menus fit into any pocket or wallet and allow your customers to choose their meal in advance and show your offers to colleagues and friends. For many, this is a daily question: "Where do we go to eat?"